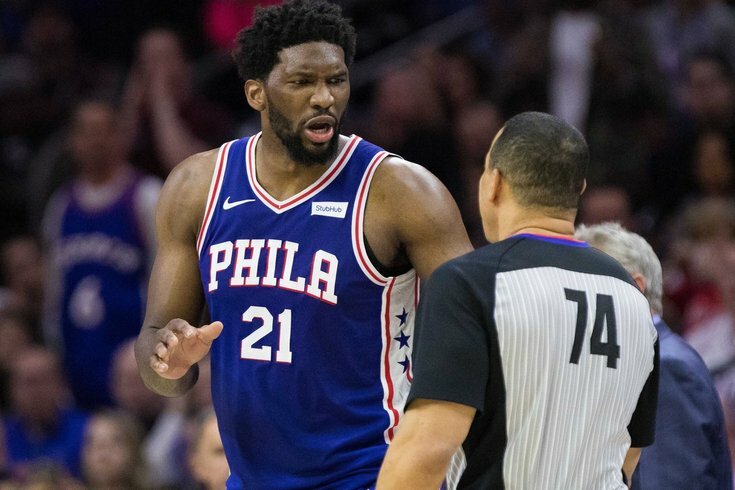 Philadelphia 76ers center Joel Embiid (21) reacts with referee Curtis Blair (74) after being called for a technical foul during the second quarter against the Boston Celtics at Wells Fargo Center. Joel Embiid was an absolute force of nature against the Boston Celtics on Wednesday night, and the story could basically end there. Philadelphia's franchise center dragged his team to a victory with some assistance from Jimmy Butler in the fourth quarter, and the Sixers have put themselves in prime position for the No. 3 seed with a 118-115 victory over the Celtics. Here's what I saw Wednesday night, with more to come later. • If anyone needed to have a big performance against the Celtics, it was Joel Embiid. And after a night off on Tuesday, Embiid came out of the tunnel like he was shot out of a cannon, and was basically the only reason the Sixers weren't getting absolutely crushed at halftime on Wednesday. Before the game, Brett Brown told reporters that he doesn't buy into Embiid being impacted by the Horford matchup as much as everyone else does. The Sixers believe if Embiid acts more decisively — playing out of "0.5" as Brown calls it — he can have a lot more success against the Celtics. He certainly got the message across to Embiid. The big man attacked the rim with gusto, and he refused to be baited into the three-point shots Boston often gets him to take. He even used their sagging against Boston at times, hitting Ben Simmons with a gorgeous feed out of his pump fake. Horford, who has dominated this matchup, spent a lot of the game focusing his efforts on Simmons and Tobias Harris instead of Embiid. That's as clear a sign as any that Embiid came ready to dominate the matchup — Boston focused their efforts elsewhere. For all that he did on offense, and boy did he do a lot, Embiid was just as good if not better on the defensive end. The recoveries he's capable of making are just insane — he was somehow Philadelphia's best option defending Kyrie Irving, he devoured guys at the rim, he owned this damn game. I don't have any idea what the future of this team holds. They fit weirdly together, they have flaws, and at times they are not as good as they should be. But I am sure of this — Embiid plays with a championship-level demeanor, and he is one of the precious few players on the planet whose spirit matches his superstar-level talent. A performance like that is why you watch sports at all, rooting allegiances or not. That dude put on for his team and his city as hard as he possibly could. He had 38 points and 22 rebounds. If you can't appreciate that, don't bother tuning in. • You will not see me spotlight JJ Redick's defense all that often, but that is the hardest I have seen him compete in any game since he has been here. He made an assortment of Celtics work for every inch of space they tried to take, whether it was Marcus Smart, Jaylen Brown, Terry Rozier, or even Kyrie Irving. The man successfully defended Horford in the post on a possession. He was not very helpful on the offensive end outside of a brief stretch in the third quarter. But you could say the same about a few of his more talented teammates, and they didn't bring the proper energy at the other end. I salute the commitment. • I simply do not understand Butler, because it's very clear what he has when he digs down deep. The guy was unreal on offense in the fourth quarter, as he has often been for Philly. So why is he passing up wide open threes in the first three quarters to dribble into a pull up two? Why is he then taking contested pull up threes with 19 on the shot clock? It's mystifying. No one can dispute his ceiling or how good he is. Anybody with two eyes can see that guy is a killer in crunch time, and there is no chance the Sixers win that game without him. He did not just hit huge shots, he was the assist man on some of Philadelphia's biggest possessions of the game, and that is exactly what he brings to the table. He can beat you all over. Give me that Butler any and every day of the week. He is a goddamn killer. Just give it to me for four quarters, brother. • Ben Simmons did not have his loudest night at the office, but he had a huge bucket to put Philadelphia into the lead with the game in the balance, and he stepped up and nailed the free throw that effectively won the game. Everyone had to clear out the demons tonight, and they got it done. Still some things to clean up, but that was as necessary a victory as a team could ever procure in the regular season. • I don't know what it is with this group recently, but they are giving up some absolutely ridiculous offensive rebounds that are turning into second-chance points. There are a lot of things you can excuse with this team because of their unfamiliarity together, namely offensive and defensive execution. Rebounding does not fall under that umbrella. The shame of it is, this team is erasing the work on a lot of their best defensive possessions by letting up before completing them. Boston came up with some backbreaking rebounds in the first half when it looked like the Sixers were starting to build some momentum, and when every game in a rivalry tends to be close, every possession matters. • Philadelphia has a serious problem behind Embiid — I'm not sure any of their big guys will be playable in a series against Boston, Milwaukee, or Toronto, AKA the three teams that actually matter in the East. That's pretty awful, considering the resources they have invested there. Boban Marjanovic is a great novelty act who can beat up on bad teams, but he looked like a rusty, creaking robot against a Boston team that spreads the floor. That's not going to be any different in April or May or June. And the other options are arguably worse — Jonah Bolden has proven he still can't make reads well enough to anchor a defense, and Amir Johnson doesn't have the legs. Justin Patton certainly isn't going to turn into a playoff-caliber big this late in the game, either. The Sixers should probably just go small behind Embiid, and they haven't even been very good with Simmons or Mike Scott as the nominal big. That's how bad the other options are. And by the way, maybe this team should have invested some of their resources in a guard, any guard, who could dribble and hit threes instead of bigs who had little chance to make a difference in the playoffs. • The officiating in this game was an absolute train wreck. They did not will Boston's jumpers in or fail to collect offensive rebounds, and are ultimately not responsible for the result, good or bad. But having such piss poor refereeing in what should be one of the marquee games of the year is a crime, and the league should demand better than this. It went both ways. Al Horford raked Simmons and Embiid across the arms inside, no call. Embiid straight up tackled Irving when he was out of control on a defensive possession, no call, Sixers fastbreak dunk the other way. They were wildly incompetent and had no rhyme or reason to what they called or didn't call. It's bad for the product and the sport that this stuff happens routinely. • I think there are strategic and systemic reasons the Sixers often fail against the Celtics. I could not tell you why Terry Rozier suddenly turns into Michael Jordan when he's playing Philly. It's beyond belief. Think an ejection was absolutely warranted for that play. But let me say this — when officials don't have control of a game, this is the sort of thing that tends to happen.